A new solar project in the Eldorado Valley energy zone is expected to break ground by the end of the year, bumping Boulder City’s total to five as it continues to pave the way for green energy use across the country. 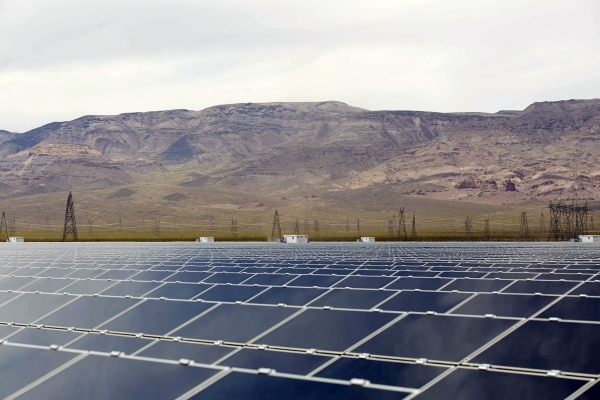 Nevada Power, a subsidiary of NV Energy, is seeking approval from state regulators to build two 100-megawatt renewable solar energy projects as part of a three-year plan to help replace the utility’s coal-fired electrical capacity set to be fully retired by 2019.SunPower will build the project for NV Energy, which will then sell the power to about 15,000 of its customers. Boulder Solar, as the project is called, is expected to be under construction by the end of the year, according to a SunPower press release. Though SunPower announced its intention to build a solar plant in Boulder City, city staff said it has yet to receive any formal plans from the company. SunPower is already paying the city for the lease space in the Eldorado Valley after purchasing the land from KOMIPO earlier this year, Armantrout said. KOMIPO was the original company in charge of Boulder Solar, though it never acquired a power purchase agreement for the project. According to SunPower, Boulder Solar is expected to create approximately 200 jobs, with commercial operation planned for 2016.According to estimates provided by the U.S. Environmental Protection Agency, Boulder Solar also is expected to negate nearly 192,000 tons of carbon dioxide emissions annually, the equivalent of removing more than 740,000 cars from Nevada’s roads over the next 20 years. There are currently four completed solar projects in Boulder City, including Sempra U.S. Gas & Power’s Copper Mountain Solars 1, 2 and 3, as well as Acciona Energy’s Nevada Solar One project. Of the four operational plants, Nevada Solar One is the only one to sell its power to NV Energy, Armantrout said. Energy generated from the Copper Mountain Solar complex goes to the cities of Los Angeles and Burbank, Calif., where approximately 180,000 customers receive the power. NV Energy did not return multiple calls for comment.